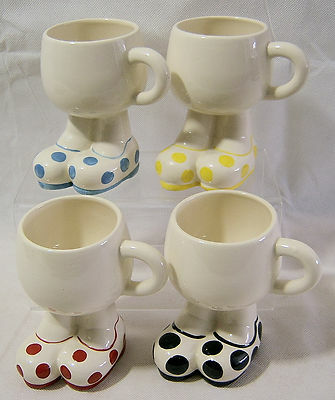 A chance to buy all four different coloured spots in this 'Big Foot' range of Tea Cups . Designed by Roger Michell (Lustre Pottery) for Carlton Ware , this particular set has the very collectable four large yellow, red, black blue-spotted shoes. The overall height of each Cup is just under 5 inches (12 cms). Each Cup is in excellent condition. There is no evidence of crazing and they are backstamped under one foot. I can provide further photos if required . UK standard delivery is FREE OF CHARGE .